Every Shabbos morning we sing the Keil Adon prayer. It is a very beautiful description of how Hashem has empowered the luminaries to shine forth and how they are completely subservient to Him. There is a lot of mysticism hinted to in this prayer and it mentions the idea of the Merkava as well as containing some very deep kabbalistic secrets. "שבח נותנים לו כל צבא מרום"
"Praise is given to Him from the hosts of the heaven." If one takes the first letters of the primary words; shin, nun, kaf, tzadi and mem, he will find that they can spell Shabsai (Saturn), Nogah (Venus), Kochav (Mercury), Tzedek (Jupiter) and Maadim (Mars). Thus, all the naked eye luminaries are found in this prayer. The sun and moon were mentioned in the earlier verses and the other five are hinted to in this verse. Additionally, if one looks at how many words there are in between each comma he will notice that there are 5 then 5, then a bunch of 4's and finally the last two are 6 and 6. The first two segments, each of five, says the Abudraham, represent the Ten Commandments. All the verses that have 4 per segment equal a total of 72 which represents one of Hashem's holy names which contains 72 letters. The last two segments, each of 6, represent the twelve signs of the zodiac. Thus, not only are all the luminaries hinted to in this prayer, but the twelve signs of the zodiac can be seen as well. The Abudraham was certainly far more familiar with the mystical intricacies and the nuances and style used by this prayer's composer. Had it not been for his commentary I would gave suggested one other piece. The verse above that hinted to the planets also contained the word לו. For some reason the Abudraham felt the composer was not alluding to anything with this word. Had it not been for this statement I would have suggested that the lamed that begins this word is hinting to Levana (moon) and then six of the seven luminaries would have been mentioned in this verse. Why is the sun the only not mentioned you ask? Well, I would have suggested that is because it is mentioned in the earlier verse when we are told that "Hashem called to the sun and it radiated light." If so, why is the moon hinted you may ask, since the moon was mentioned in that same verse as it says, "He saw and affixed the shape of the moon?" To this I would have responded that that verse is really only discussing the moon because by doing so it gives perspective to the sun's purpose. The Abudraham states that the meaning of that verse is that Hashem called to the sun in order for it to shine light. Hashem then created the moon so that many would recognize that the sun has a counterpart and it is therefore not befitting to worship the sun. Thus, the moon is not really being mentioned in that sentence to tell us about the moon, rather, that verse is focused on the sun. In fact, the Rokeach gives a very detailed commentary on this prayer, as well. In it he shows how this prayer is mainly discussing the sun. The segments of 4 each which are what the bulk of the prayer is comprised is viewed as pairs of 4 which equal 8. The Rokeach then discussed how there are 8 angels that are charged with carrying out the solar motion and there are a total of 72 every day. Thus, we have these segments of pairs of four which total 72. With all this I would have suggested that six of the seven luminaries are hinted to in that other verse and the seventh, the sun, is the focus of the entire prayer. However, I gladly defer to the Abudraham as his knowledge of the mysticism and the nuances and style of the composer is clearly far greater than mine. In the beginning of this week's Parsha we are informed that Moshe gathered together all of Klal Yisrael in order to begin the construction of the Mishkan. (See Rashbam, Ibn Ezra and Ramban Shemos 35:1) It seems that in order to build the Mishkan, the place from which Hashem's glory could be perceived, it was necessary for the entirety of Klal Yisrael to be gathered together. I have always seen this as being an extremely important lesson. In order for Klal Yisrael to allow Hashem's glory to shine through our actions, it is first necessary for all of us to unify and act as one. I also find it interesting to note that this Parsha is generally read as we approach the spring. Not only do we find many ideas of unification in the Megillah which is read during the month of Adar, but there is a very interesting phenomenon that occurs in the sky this time of year. After the sun sets below the horizon its light is still able to be seen due to it being reflected off the atmosphere and clouds. This is why after sunset we have a period of twilight during which the sun's rays slowly diminish until they are no longer perceptible. As spring approaches one can see another form of light even after twilight. Although the sun's rays are no longer being reflected back to our planet, in dark skies one can perceive a glow emanating from the horizon and rising up into the sky. It appears somewhat triangular with its base on the ground and is a very pretty sight. 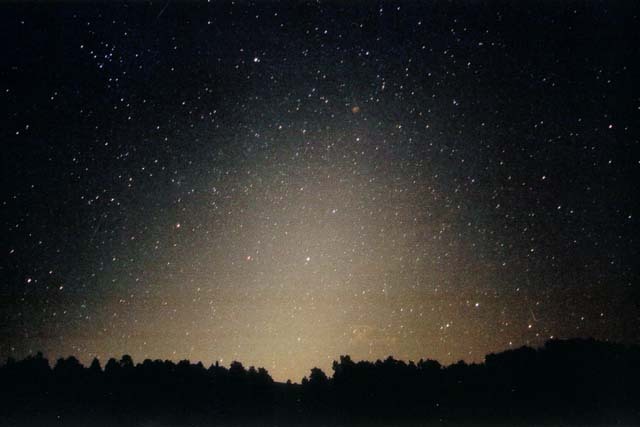 This light is called zodiacal light and what we are seeing is many tiny dust particles that are far off in the Solar System that are reflecting the sun's light. This is very similar to how planets can be seen as stars since they too reflect the sun's light and are then perceptible back here on Earth. This light can be seen twice a year, during the spring and autumn. In the springtime it is noticeable after the evening twilight and in the autumn it is noticeable just before dawn. Each speck of dust by itself reflects a miniscule amount of light. In fact, by themselves these cosmic grains would be totally invisible to us. However, when they are all seen together they reflect a beautiful glow. If one were to condense all the specks into one big chunk, its light would be so bright that it would be the brightest star/planet in the sky. Each member of Klal Yisrael reflects light in a unique way, but it is when all the individuals unite that we can see a truly brilliant radiance. Although Hashem did, in fact, forgive Klal Yisrael, we are taught that because of Moshe’s tremendous stature that his request could not be completely denied. According to the understanding that it was the Torah from which Moshe was requesting to be erased from, this erasure is found in Parshas Tetzaveh. Starting from Shemos when the Torah first discusses his birth, Tetzaveh is the only Parsha that does not contain Moshe’s name in it. (See above comentaries) The question one can ask is how then was this request seen in accordance with the understanding that Moshe was requesting erasure from the book of stars? I find the following parallels very telling and based on them would like to offer some suggestions. When one simply counts the amount of Parshiyos that exist from Shemos, the first in which Moshe is mentioned, through the end one will find there to be thirty-six Parshiyos. Thus, Moshe’s name can be found in thrity-five of the thirty-six Parshiyos. (The Parshiyos were added by considering all double Parshiyos that can be read as such in Eretz Yisrael as one Parsha). When Moshe asks Hashem to erase him he says that it should be done from "ספרך" “your book”. The numerical value of this word is 360. Since ancient times it has been recognized that all the stars occupy an area of 360 degrees and this number reflects a spiritual understanding of the stars themselves. (See Ibn Ezra Reishis Chachama 1) The sky above the horizon is 180 degrees and then that which is below the ground adds the other 180. If we take a ratio of 36:360 which represents the total of Parshiyos to the total degrees in the sky then we should expect Moshe to be erased from 10 degrees in the sky because our ratio would equal 1:10. When Hashem responds to Moshe he says, “מי אשר חטא לי אמחנו מספרי” “Who is it that has sinned that I should erase him from My book.” The book is now called as “My” book as opposed to “Your” book since it is now Hashem’s response and from His perspective. As mentioned before, ספרך, had a value of 360, but ספרי has only a value of 350. The מ at the beginning of these words connotes to take from. Perhaps Hashem when saying, “מי”, which literally means “who”, was also meant to be taken as “from י”. Meaning that Hashem was going to take י, whose numerical value is 10, from ספרך which equals 360. The result is ספרי which equals 350. Thus, our ratio from above 36:360 = 35:350. Just like 35/36 of the Parshiyos have Moshe in them and he was erased from 1/36, so too, 350/360 of the degrees of the sky have Moshe expressed and 10/360 do not. Another possibility could also have to do with the moon and its apparent position relative to the sun. Throughout the year the sun appears to move from one area of the stellar background to another. The path it takes is called the ecliptic. The moon always stays relatively close to the ecliptic, as well. The moon will always be within approximately 5 degrees north or south of the ecliptic (it can be as much as 180 degrees east or west of the position of the sun on the ecliptic which is why the moon can be many more than just 5 degrees from the sun). We know that the sun is considered to be the ruler of daytime and the moon of the nighttime. (See Bereishis 1:16) Perhaps the erasure of Moshe, compared to the sun, is seen that his competing counterpart has ten degrees through which it can move while the sun always stays directly on the ecliptic. I must say, though, that both of these are only theories and I would love to hear if anyone has any other suggestion. I definitely feel more partial to the first of these two suggestions.